Pet Friendly seaside cottage - Great for couples, families or groups. Open fireplace to toast your marshmallows! Enjoy Phillip Island's oldest cottage during winter. For a very special experience this is a beautiful home restored to it's original charm in a picturesque setting with tranquil views overlooking beautiful Swan Bay. Suitable for couples, families or groups. Open fire place, vaulted ceilings, chandeliers and old world charm blend together with modern day comforts. The house has four bedrooms, two bathrooms, two living areas, large country kitchen and dining with a wood stove for home style cooking and for the less adventurous, microwave, electric hotplate / oven and BBQ.There is also a herb garden and lemon tree to compliment the best cooking. The two delightful double bedrooms with comfortable period furnishings and main bathroom form a parents' retreat from the rest of the house. Two additional bedrooms have single beds. There are two bathrooms, one with a separate shower and enormous claw-foot bath to soak in, the other a shower over bath. Linen can be provided at an extra charge of $20/bed. Walk through the French doors of your bedroom to the expansive deck and enjoy the breathtaking views across the bay or enjoy the ambiance of the 100 year old orchard and cottage garden. Experience the charm of historic Rhyll with only a 5 minute drive to the Island's main town, Cowes, the Penguin Parade and the Grand Prix track. In the cool of the evenings relax on the deck or in front of the open fire and take in the ambiance of beautiful Swan Bay. Perfect for couples, families or groups. - What a truly unique experience. - A real beach house! - Brekky on the deck - Amazing! Dinner at twilight - Heaven! Sleeps 9. Bedrooms: 1 Queen, 1 Double, 3 Singles, 2 Singles. Open fire place, large flat screen TV, DVD, CD. Full laundry facilities with washing machine and dryer. Linen & towels provided (extra charge). Reverse cycle air conditioner/heater. No schoolies please. We first discovered Captain Lock's Cottage in 2000. It was dilapidated but oozed charm. We renovated with the intention to retain all of it's history and original ambience. The cottage is very comfortable with all of the creature comforts you need for your holiday. The cottage garden was developed using plants from the original garden. It is truly a gem that won't disappoint. Captain Lock's Cottage was built in 1869 and is one of the original cottages built on the Island. The first white child was born in the cottage! There is a plaque commemorating Captain Lock at the local jetty. The cottage was built in three stages by Captain Lock, the first part being built from sealer's huts from French Island that were dismantled and re purposed to build a home for Captain Lock and his family. We fell in love with it and saw the potential of restoring it to it's original charm. When we first peered through the windows we saw the original chandeliers hanging from the vaulted ceilings! The views were gorgeous and Rhyll itself had an ambience that we fell in love with. It is a dear cottage that all our travelers love. This is one of the oldest cottages on the Island. The garden compliments the ambience of this home. It is indeed a Home Away from home! toilet, combination tub/shower, shower, This bathroom has a very large claw foot bath to soak in. toilet, combination tub/shower, There is a separate toilet available. A small General store and some restaurants are a short walking distance away. The main town centre of Cowes is a 5 minute drive away. If you like to swim in the surf, the cottage is a 5 minute drive away from patrolled safe surfing beaches. Rhyll is a gorgeous fishing village away from the tourist centres of Rhyll, but only a 5 minute drive away from most attractions. 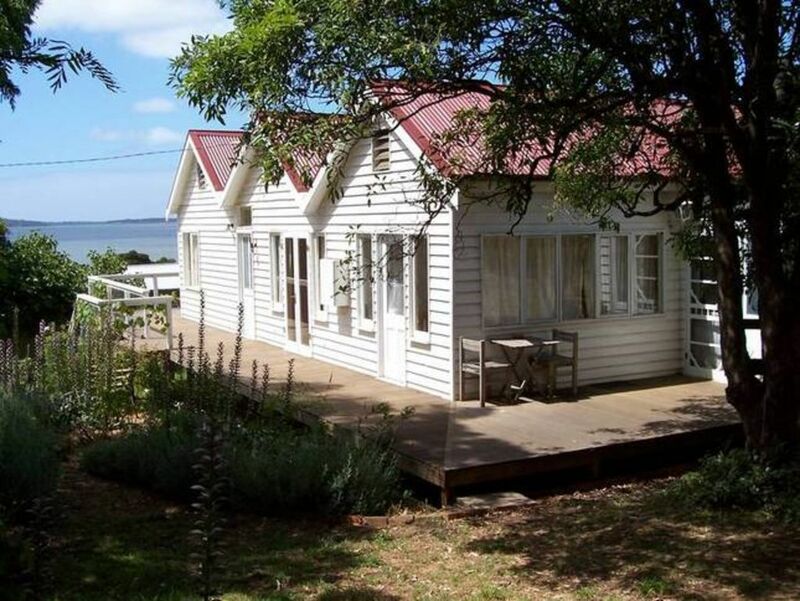 Captain Lock's cottage has the most amazing view overlooking Westernport Bay, the Rhyll Pier and Churchill Island. There is an easy 50 metre walk to the water front. The Silverleaves golf course is a 5 minute drive away. Beautiful view overlooking Westernport Bay. Spectacular views overlooking Westernport Bay. On still days, the sunrise and sunset reflect in the calm waters of Westernport Bay. The cottage is set so close to the water that the beautiful sea breeze refreshes on the hottest of days. An extra charge of $25/bed. Quality washing machine and dryer provided. Quality washing machine and dryer available. The ambiance of a beautiful open fire features in the main living room. Towels are included when linen is ordered @ $25/bed. Two living rooms available. One with an open fire, the other with TV and DVD. A standard quality fridge/freezer is provided. Slow combustion wood stove available. It makes wonderful roasts and scones! A coffee grinder and plunger is available to make that delicious morning cup of coffee. All necessary cooking utensils are available. The kitchen is fully equipped with electric cook top and oven, microwave and a wonderful slow combustion stove. Quality pots and crockery are provided. The second living room has TV and DVD. Captain Lock's Cottage has a quaint cottage garden at the front, a her garden along the side of the cottage and a very old orchard in the back garden. Boat hire available from the local Boating Store. Extensive decking wraps around the cottage with gorgeous views of the bay and pier. Boats are available for hire from the local Boating shop. Tennis court hire available from the local General Store. Court situated a 5 minute walk from the cottage. Golf course located at Silver Leaves, a 5 minute drive from the property. Old & charming with character. Home away from home with great views. Great for large families. Spacious rooms and balcony overlooking beach. Clean & tidy. Linen not provided which would have made our stay even better if it was..10 min drive to Cowes. Overall I would highly recommend and would stay there again. Our initial impression was one of disappointment - we were greeted by a badly ripped throw rug, dirty curtains and a very white sofa (no comfy recliners). When paying a substantial amount per night with extra for linen and dogs, we expected a little more comfort. Fortunately the house has a few things going for it - lots of space and a close walk to the water and town. Admittedly, the style is 'shabby-chic' but some maintenance is required eg broken door knobs, missing door handles, badly sticking doors, no window screens and dripping taps. The whole house could do with a paint which would no only improve the look but would make it feel cleaner. In regards to cleanliness - we found a bone, old birthday card and a plastic lid all within the main living area and we had to clean the microwave prior to use. We appreciated the little extras like the piano, old crockery and flower left on kitchen table. But it is the lack of other little extras eg DVDs and laundry powder that we wanted. We did enjoy our stay and the house certainly grew on us. Thank you for your review as we value feedback from our customers. Captain Lock's cottage is one of the oldest homes on the Island and we have retained much of the original cottage. We have also furnished the cottage to suit not only the era but also to create a relaxed, peaceful ambience which many of our guests have enjoyed. The cottage is unique and offers a holiday experience full of history and charm which is not common to holiday properties. We will certainly attend to maintenance items and appreciate your attention to detail. What a great weekend getaway! I enjoyed the spaciousness of the cottage the relaxing atmosphere ,the decor felt like we had escaped to another world. We enjoyed sitting on the balcony taking in the sea view. It gave me an opportunity to refresh myself and escape from pressures of life. Very cute and quaint. Good location. It was a cute and old fashioned cottage. Had all the amenities we needed and relaxing feel that we wanted. A few things looked like they needed some love. But overall a great place to stay! Rhyll is nestled on the sheltered, green side of Phillip Island. It is full of bird life being situated in World Heritage listed Mangroves. It is away from the hype of the tourist centres on the Island and a short walk to the dog friendly beaches. The Fairy Penguins, Koalas, Seals and Kangaroos are a 'must see' of the Island.